It is hard to identify what the symbol of this bike ride should be. 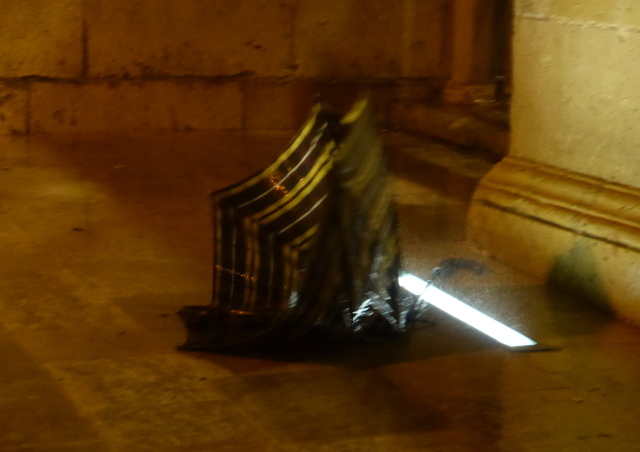 One of the many broken umbrellas littering the ground? The cars driving through flooded roads? Or just about any blurry photo with rain on the lens and almost no visibility? 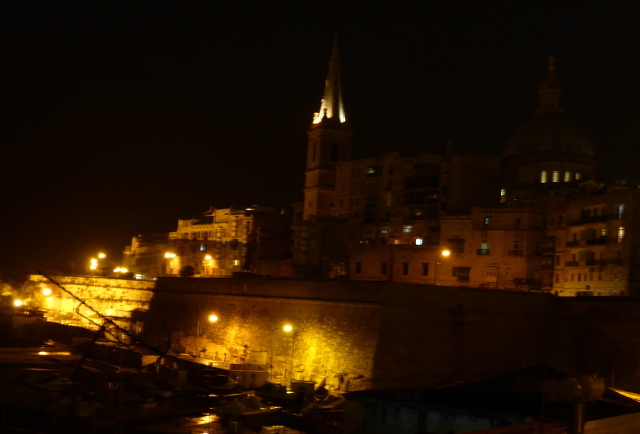 It should have been the night skyline of Valletta, capital of Malta and one of the great fortresses of the sea, sitting on its headland above the Mediterranean. 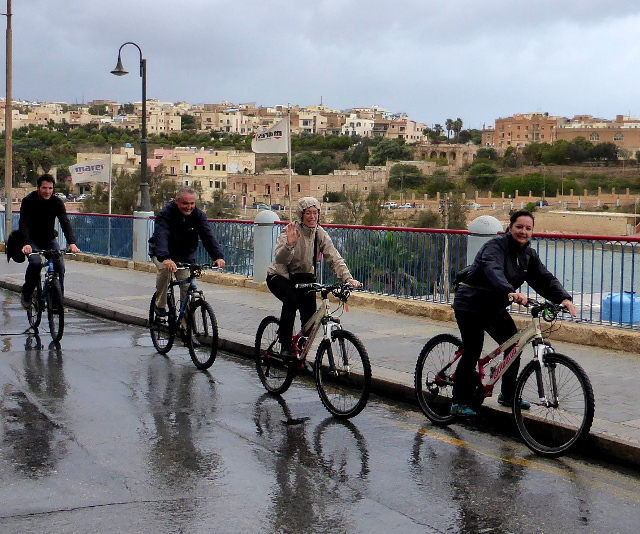 The fact that it was only a few kilometres from our hotel made Valetta the perfect destination for a Friday afternoon ride after working nearby all week. In fact it turned into one of the most memorable rides I have done in a very long time. Certainly the wettest and in all probability one of the maddest. 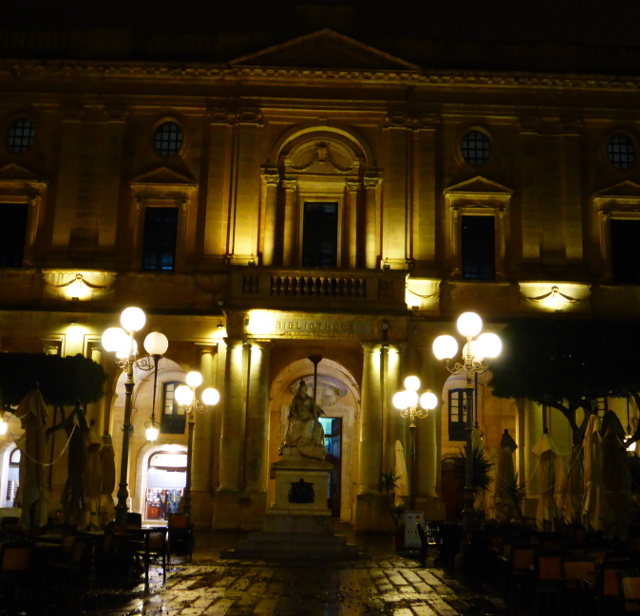 We collected our bikes at 3.30 in the afternoon so we knew we didn’t have much daylight, but I figured I might bike to Valetta, walk around the city a bit, take some photos and perhaps grab a meal so the onset of evening wouldn’t matter. 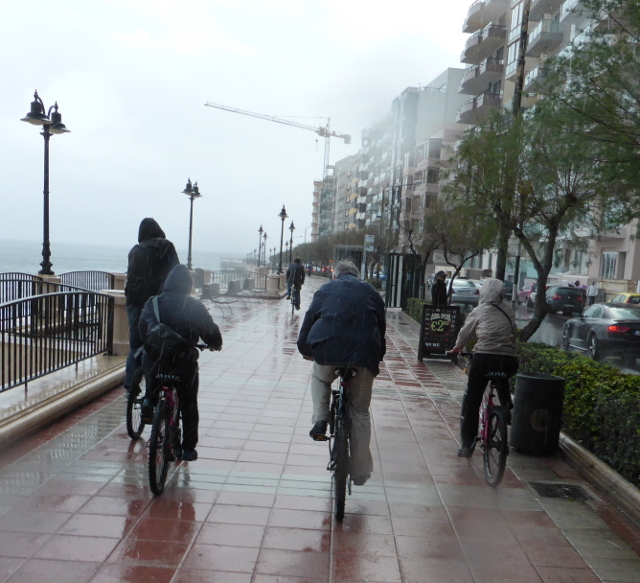 The first part of the ride was a bit wet and windy but our group of three Austrians, one Italian, one Dutchman and myself pottered along the coast roads, ducking in and out of the bays. There was even a rainbow out to sea. 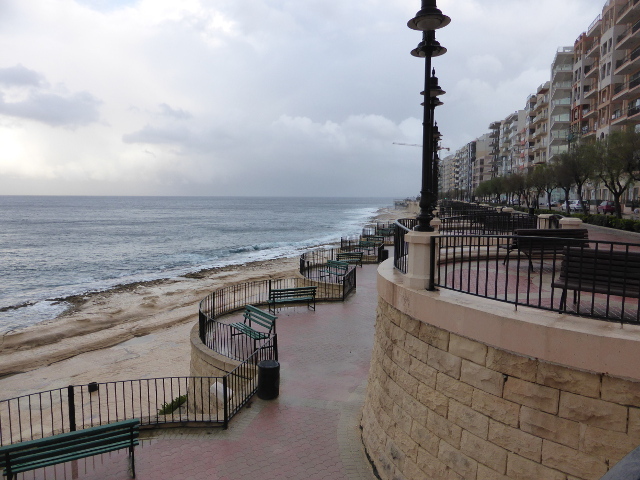 However as we reached the final headland before we turned down to Sliema and Valetta the skies just opened so we decided a coffee break was better than getting soaked. Fortunately we discovered that a new shopping centre had opened at the harbour mouth near Fort Tigne and it had a very nice coffee shop just when we needed it. 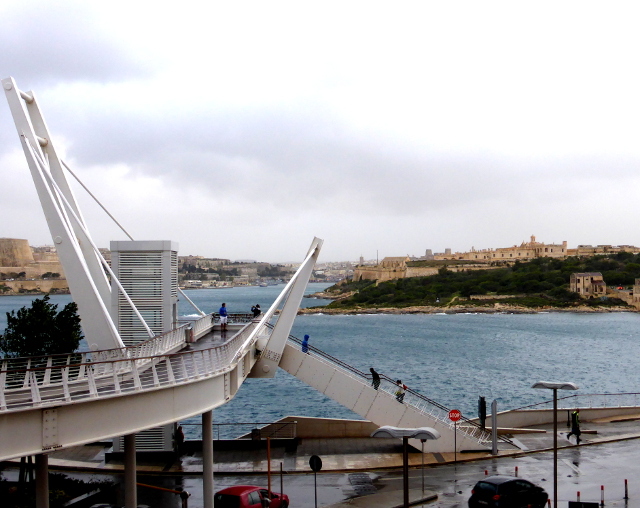 In between the rain showers we also found that it had a brilliant viewing platform that offered a panoramic view over the harbour, Sliema and Valetta. It had its own rather unique dress code too, but not one that bothered me too much. From there things started to get “interesting”. The clue was when there was so much rain beating on the café windows that we were often not able to see the bikes, the bikes blew over, there were umbrellas collapsing and the staff started mopping up leaks flooding through the door seals. My friends thought it was hilarious when I suggested I would “just nip outside” and in the time it took me to get to the door a squall hit and nearly blew me back into the café. At that point most of the others decided enough was enough. Matthias from Austria decided he was headed for the hotel but the others put in the emergency call to our very supportive hire operator Denis to come and rescue them. 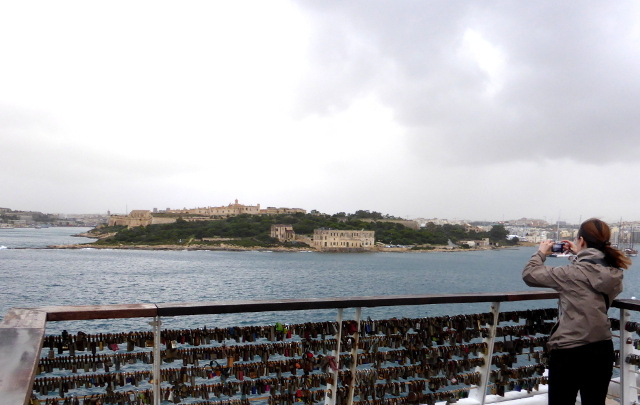 I just felt sure it would blow itself out, I wanted to get to Valetta and I knew most of the rest of the ride was in the sheltered harbour. In hindsight I was probably a bit stir crazy from a week of hotel living and meetings but I certainly was determined to get in a bit more of a ride. 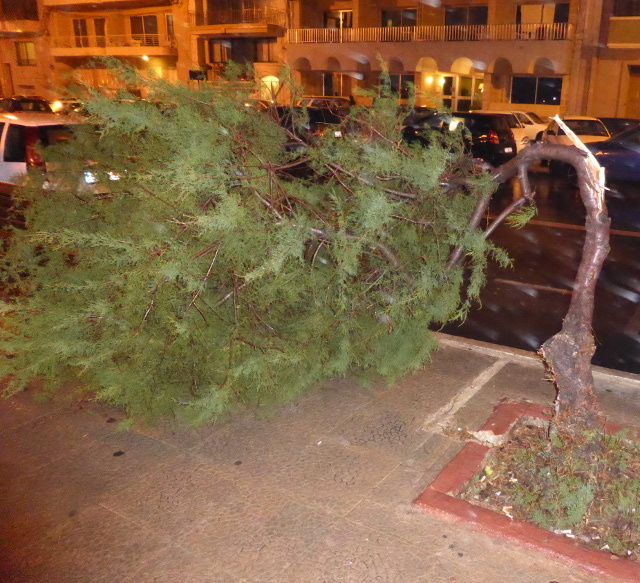 I got the first part of my prediction right because as soon as I dropped away from Tignes onto the waterfront I had good views to Valetta and I had a reasonably dry ride along the deserted promenade, provided I kept my eye on the broken branches and fallen trees. For about 4km I zig-zagged my way around headlands, marinas, promenades and moorings, going onto the road occasionally but enjoying my exploration. 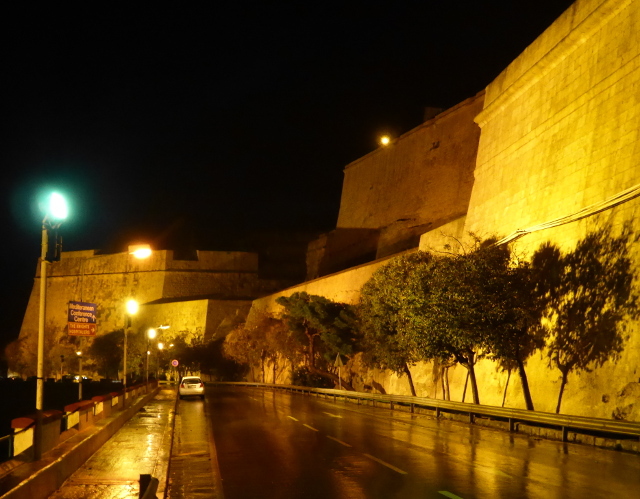 Then almost suddenly I turned towards the walls of Valetta, climbing steeply up through the city walls onto the flat plateau with grand buildings and big squares, legacy of empires and occupation. 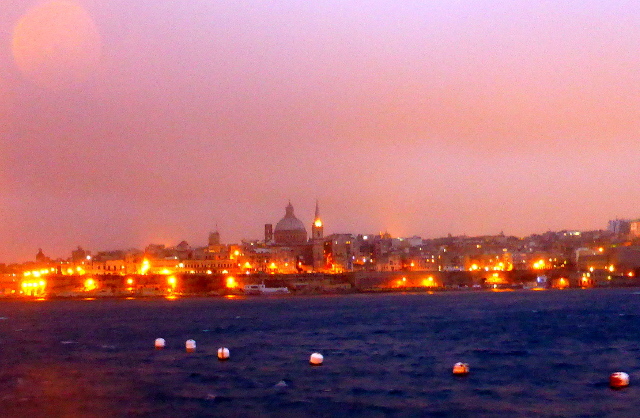 Valetta was created as a headquarters for the Knights of the Order of John after the Siege of Malta in 1565 but its architecture and development very much reflected the fact that Malta is a strategic crossroads in the Mediterranean which has been attacked and invaded constantly for nearly two thousand years. 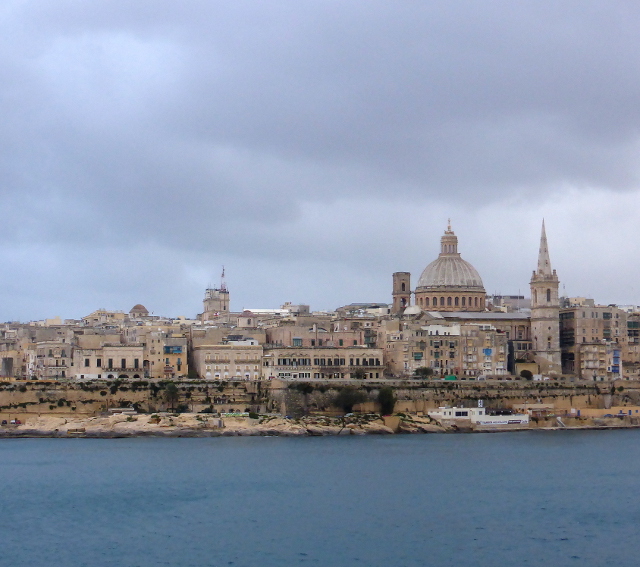 The city is built on a headland between two bays with the ramparts that defend the city reaching down to the water. From the wide open parade grounds I dropped down below the walls again and then climbed again to an almost medieval network of narrow alleys and older buildings under the spire of the Anglican Cathedral and the Dome of the Carmelite Church which dominate the city skyline. 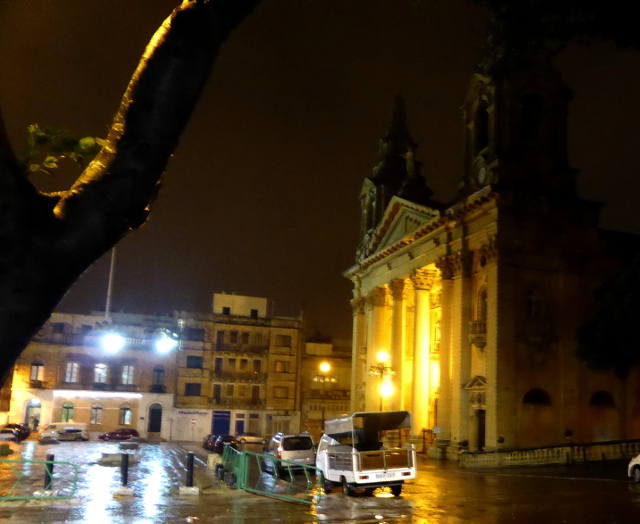 I was really enjoying the quiet atmosphere, pottering about on the bike and making mental notes about the possible cycle friendliness of the city centre for my post about cycling in Malta until I ended up in the central district. Here a wide pedestrianised street cut right through the heart of the city with every kind of architecture from wide squares to imposing public buildings. At its southern end it was very much a modern shopping street with lots of familiar high street brands. And then it all went downhill. While I was wandering round the attractive open air theatre in the ruins of the Royal Opera House the storm returned with a vengeance. 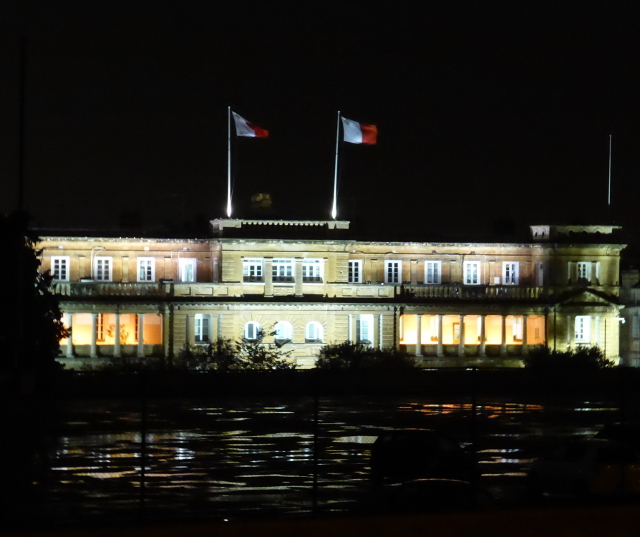 This time I wasn’t in a sheltered bay, I was right on top of a rock and the grand buildings and squares didn’t give protection, they formed wind tunnels. Within seconds I was soaked. In fact I was so wet it didn’t actually matter that I carried on walking around to look at the rest of the area. 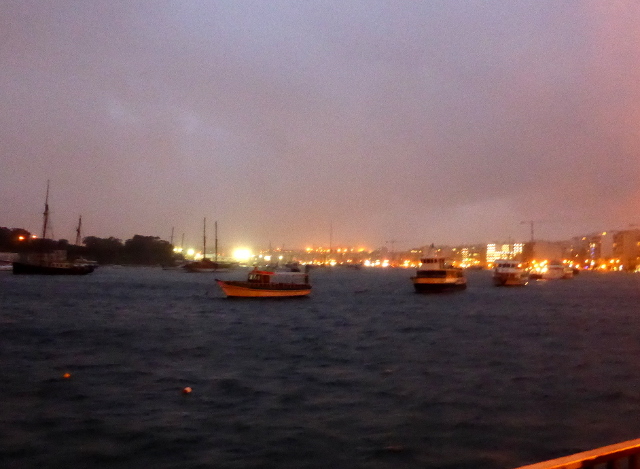 Fortunately this was like a tropical storm because while it was wild it certainly wasn’t cold. However it did matter that I could hardly move with the gusts of wind blasting round the buildings and rain was obliterating the views. 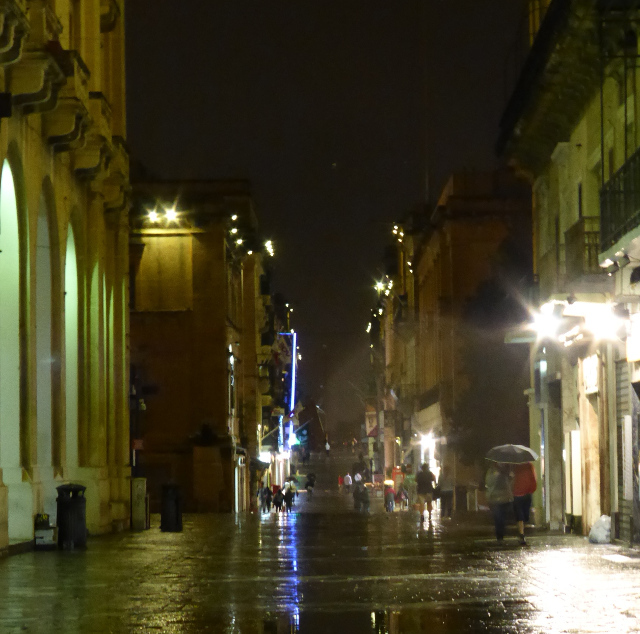 In doorways other late shoppers and tourists huddled and squealed as the water poured down. Debris swirled around on the gusts and sorry looking umbrellas flew past on the wind. However in the back of my mind the bike ride back was starting to take on a more challenging perspective and I was worried that my camera was at risk so there was no point in much more photography. No hanging around for a café supper tonight and I couldn’t imagine any of the local establishments would welcome me creating a small lake on their floor. 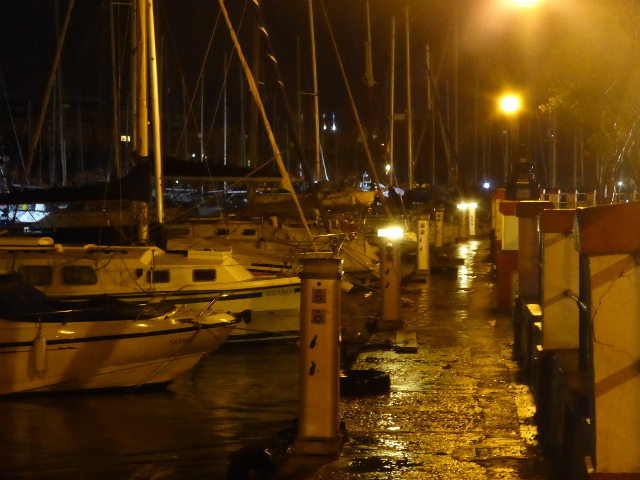 So it was off back down through the city walls to sea level again. And then it got worse. Because all that water had to go somewhere and of course it ran down to sea level. Quickly. I descended cautiously through streams and rivulets, then I found the roads down at sea level were awash, so much so that I had to ride up onto the pavement almost immediately to escape the bow wave from passing cars, ploughing through as fast as they could despite my presence. I mean I was already wet, but a bow wave is intimidating as it hits from the side. 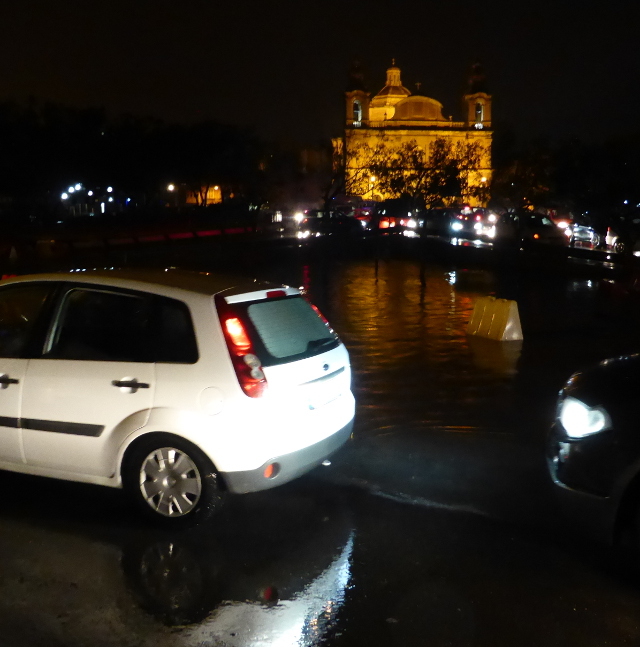 I reached the bottleneck at the Msida Marina where multiple slopes came together and there was a serious flood that was about to close the road. The police were already there trying to work out what to do with the chaos and for a moment I thought there was no way through. Needless to say the local drivers weren’t stopping for anyone, it was like a boat race. Retracing away from the junction slightly I crossed the road on foot at what can only be called the shallow end and then walked down the edge of the marina, or rather I paddled through one of the streams as it flowed from the street, over the pavement and into the harbour. 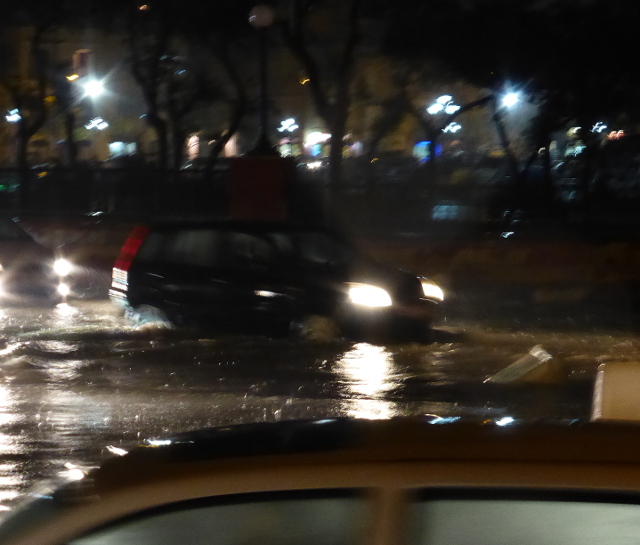 There were almost 20 metres of water between me and the cars, it was quite a sight. 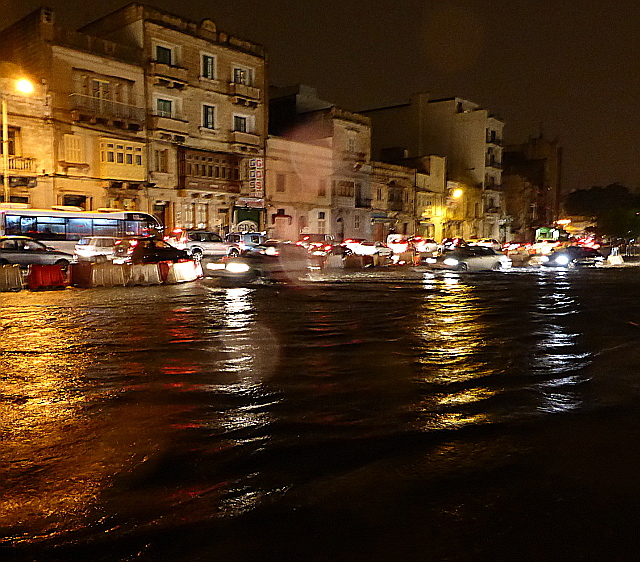 I was relieved when I was able to leave the traffic jam and climb up away from the waters on minor roads but each time I followed the roads downhill I came back to semi-flooded streets. Eventually I made it across to St Julian’s Bay and climbed the final hill up to our hotel. I had been out nearly 4 hours and I was soaked through. When I splashed into my hotel room I decanted half a cup of water from each shoe and covered my bathroom with every item of clothing before ordering a very substantial meal from room service. The trip had been nearly 4 hours with a little bit of everything. 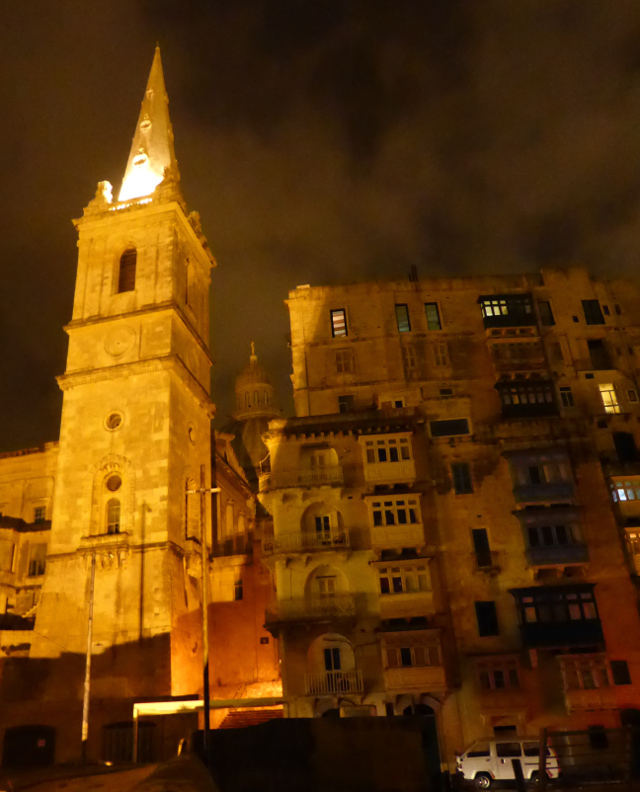 Fun company, coastal scenery, spectacular harbours, night skylines, medieval streets and lots of history. But of course it will be the storm that lingers longest in the memory. It really was spectacular to be up there on that grand old city when it broke. The only casualty was my new phone that hasn’t worked since, fortunately the camera dried quickly and I retrieved some of these blurry images for you. 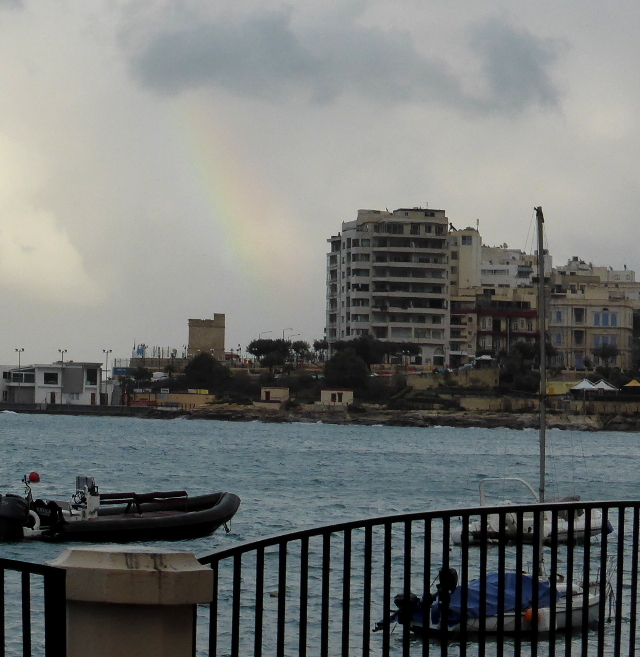 Don’t let me put you off visiting Malta because of one autumn storm. 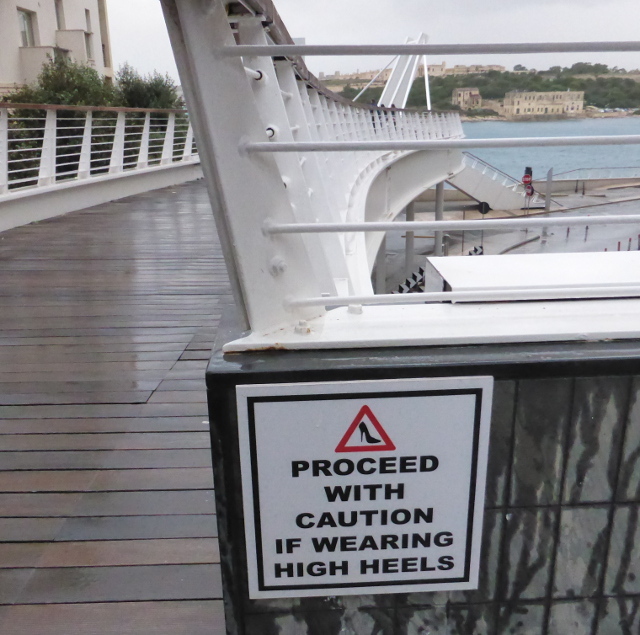 Everybody else I have spoken to since who has cycled or walked in Malta talks about wandering in shorts most of the year round. But of course if you only have one day to ride you take what comes, that is my philosophy. Again my thanks to Dennis from Bybike, without his help this memorable ride would not have taken place. 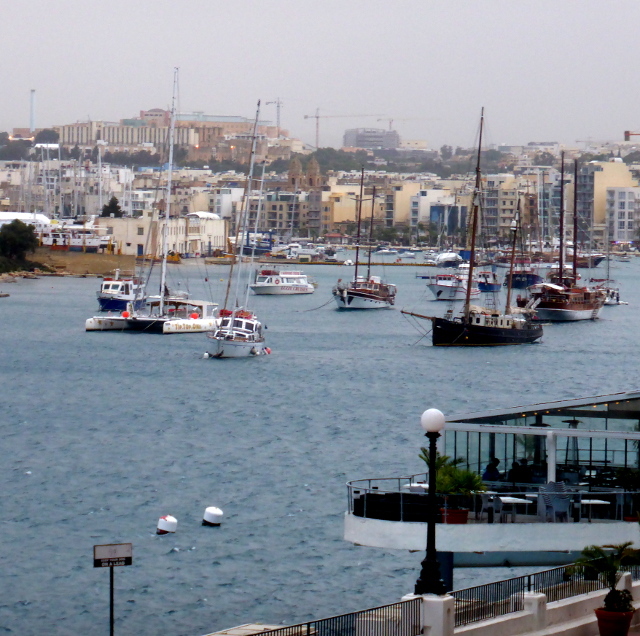 Not drowning, not despairing from Malta. 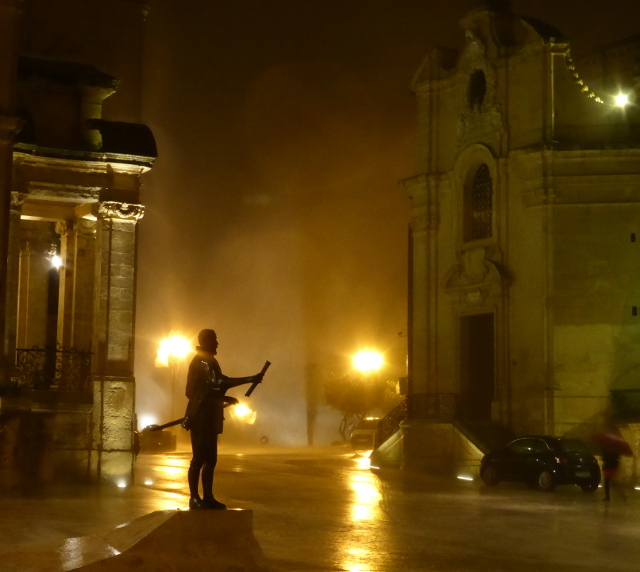 This entry was posted in Countries, Musings, Social, Travel and tagged cycle touring, cycling, Malta, rain, storms, Touring, Valetta by kevinmayne. Bookmark the permalink. Memorable, indeed! 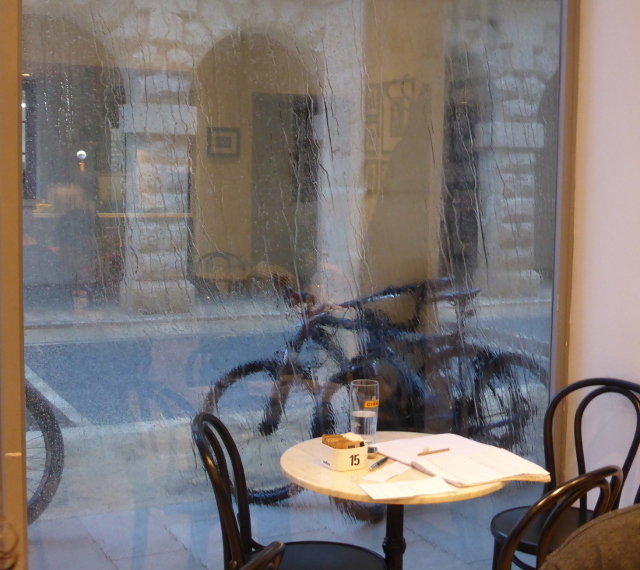 Thanks for sharing – love the photo of the bikes through the rainy window. That’s the one where you can still see them. I have another that is just a complete blur! And still time to be poetic…..
That probably shows how little riding in rain actually get done. Although there is not a doubt that more use of cheap mountain bikes is directly related to low cycling levels. There more people understand cycling the better the bikes get. Get a refund. If they want to market fancy electronic gadgets, let them be the ones to pick up the costs of NOT making them match the weather on this planet, however extreme. Modern electronics are TERRIBLE at resisting water / condensation. Modern humans terrible at standing up for their rights – and amazing at sucking it up from their boss to be exploited… but I digress. Make these overly-disposable devices as tough as the ramparts of Malta, and you’d have a good thing going! Thanks! Apparently the business model is that I now pay more for a waterproof case….sighs deeply! Perhaps like clothing we should now look for a market in cyclist friendly electronics.